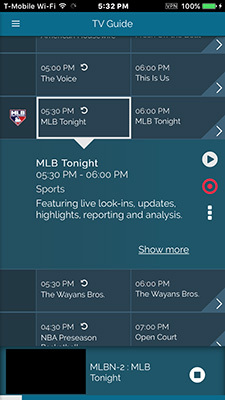 After launching Stream2, while watching live TV, users can time-shift their viewing experience using Pause and Start Over, record programs using DVR, and watch programs that aired during the past 24 hours using Catch Up. 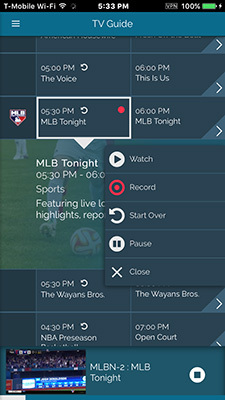 Time-shifting refers to several different features: pausing Live TV, rewinding and navigating through the duration of the current program, Start-over, and a Digital Video Recording feature. 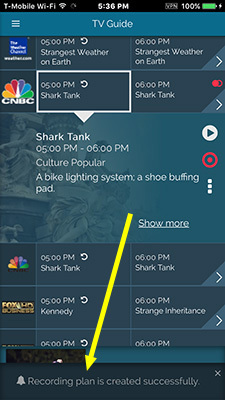 Programs in the EPG that have the rights to use the Time-Shifting features are shown in the EPG with a counterclockwise arrow next to the program title. 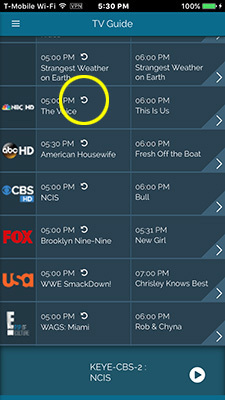 After selecting program in the EPG, the time-shifting functions of Stream2 are exposed there, to the right of the Program Info. The right-facing Play icon plays the video. The red Target icon invokes recording, and the three vertical dots below the recording button exposes additional time-shifting functions, further explained below. 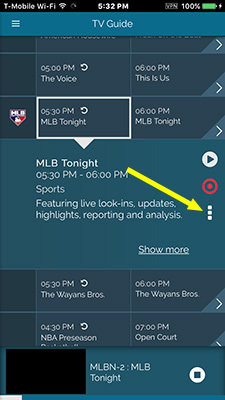 The three vertical dots below the red Target icon exposes the time-shifting "jawbone" sub-menu (with Play, Record, Start Over, Pause, and an icon to dismiss this panel). Recording can also be invoked directly from the Program Info panel, without exposing this jawbone sub-menu. 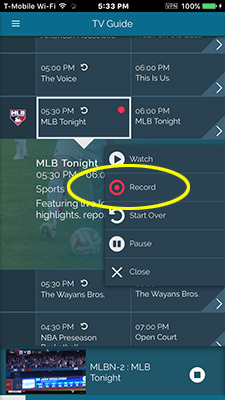 From the video player's Full Screen view, tap the screen to expose the controls for pause, start over, and channel change. Pause is indicated by the arrow. After pausing, this icon will change to a right-pointing arrow. Tap this icon to resume video play. 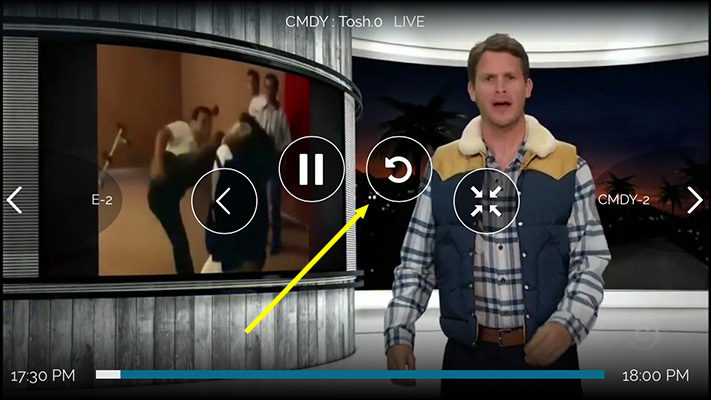 Tapping the counterclockwise arrow in the Full Screen video view will rewind the video back to the beginning. A blue dot will appear on the timeline (also called the scrubber bar) at the bottom of the screen. The dot can be dragged left or right to take you to a specific place in the program. Notice that the Start Over (counterclockwise arrow) button has turned into a Stop button. Pressing 'Stop' button takes you out of Start Over mode. The mobile smartphone and tablet layouts are almost identical. 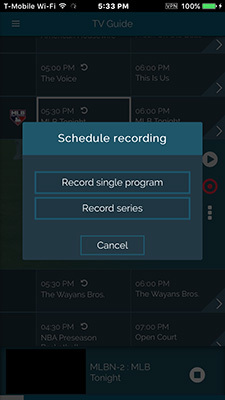 Catch-Up is a feature that lets you access programs that the Stream2 system recorded over the past 24 hours. 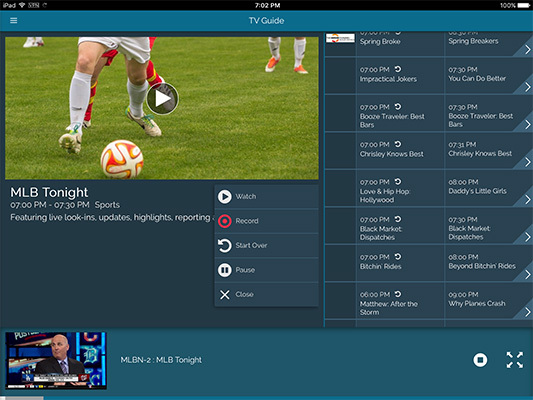 Stream2 maintains a rolling 24 hour window of past programming, which is accessed via the EPG. 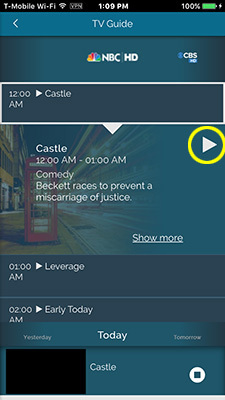 Use of the EPG is detailed on a separate page. This 24 hours of Catch Up programming resides ' in the cloud' (e.g. it is not resident in your device, so that the recorded video content doesn't use up any storage space there). To access this past programming, go to the EPG as you did above, to view current TV programming. 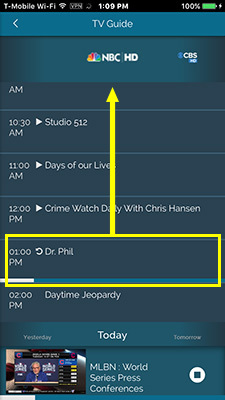 To access earlier programming, select the Channel Schedule for the desired channel, using the '>' icon on the right. 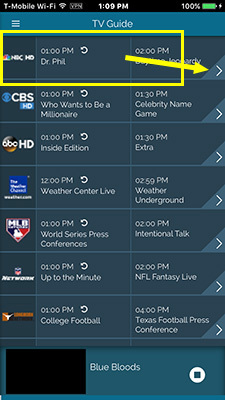 This displays the Channel Schedule. Now, scroll up to locate the earlier program that you want to play. 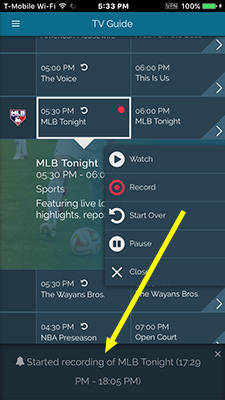 Select that program, to expose the Program Info panel with the white 'Play' icon, and tap on it to watch the program. It will begin playing in the Mini view at the bottom of the screen. Tap on the video thumbnail to bring it to Full Screen view. For instructions on how to view and manage your recordings, proceed to the Media Library instructions page.